Also Called: Many-flower scurf-pea, narrow-leaf scurf-pea. Stems: Erect or ascending, 1 to several, wiry, much-branched, longitudinally ridged, grayish hairy. Leaves: Alternate, short-stalked, palmately compound, stem-leaves 5-foliolate, branch leaves often 3-foliolate; leaflets elliptic to oblanceolate, 1/2 to 2 inches long, 1/4 to 1/2 inch wide, nearly glabrous above, stiff hairy below; margins entire; tips usually blunt or rounded, abruptly short-pointed. Inflorescences: Racemes, elongate, many-flowered, terminal. Flowers: Calyces bell-shaped, 5-lobed, lower lobe slightly longer than 4 upper lobes, conspicuously glandular-dotted; corollas papilionaceous, about 1/4 inch long, light blue to purple, usually in clusters of 2-4, stamens 10, 9 united, 1 free. Fruits: Pods, egg-shaped, smooth, about 1/3 inch long, glandular-dotted; seeds smooth, often shiny, brown. Habitat: Dry sandy or rocky prairies, open woodlands, and roadsides. Forage Value: Livestock do not particularly like it but will consume its early growth or plants cured in prairie hay. 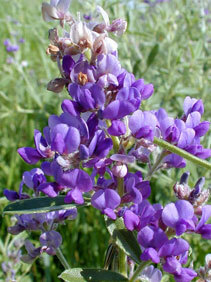 Uses: The Lakota treated headaches with a tea made from the roots and burned the plant to ward off mosquitoes. Comments: This native legume resembles alfalfa but has smaller and narrower leaves that grow less densely. Wild alfalfa is fairly drought resistant, with roots going down 10 feet.